Amazon.com description: Product Description: "This book is crammed with distilled, practical wisdom for key account managers and their directors. Organizations claiming to practise key account management should equip everyone involved with a copy, so they really understand what they are supposed to be doing. Anything less is just old-fashioned selling." Why has account management become so critical to commercial success? What are the key challenges and how do successful companies respond? What part does key account management play in strategic planning? How do companies build profitable relationships with their customers? 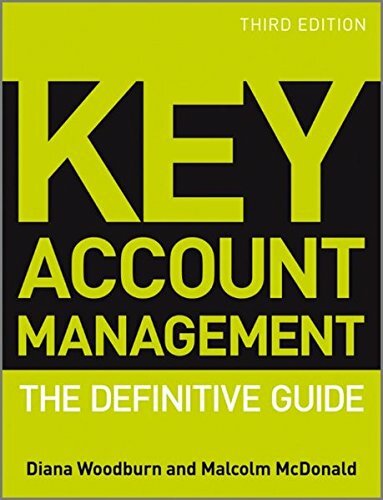 How does key account management actually work? What does a successful key account manager look like and what skills does he/she need? How should key account managers be evaluated and rewarded? By addressing these key questions Woodburn and McDonald provide tools and processes for success honed by tough consultancy projects with the boards of some of the world's leading companies. The book stresses the elements that really matter - from developing a customer categorization system that really works and analyzing the needs of key accounts; to understanding the new skills required by key account managers and ensuring that key account plans are implemented. The 'real world' approach is backed by tested principles and the latest research from the renowned Cranfield School of Management. Key Account Management comes from authors who have taught leading companies how to approach their most powerful and demanding customers and still make money. It is essential reading for all senior management with strategic responsibility, for key or strategic account directors, and for marketing and sales executives. The clear and authoritative approach also makes it an outstanding text for the serious MBA and executive student as well as business-to-business company directors and key account managers. About: "This book is crammed with distilled, practical wisdom for key account managers and their directors.